Not exactly a huge surprise here, but a new study out from NPD DisplaySearch today has confirmed that the trend towards larger screens in continuing at a steady pace in all but a few key areas. The big exception is "mobile PCs," which NPD defines as laptops and tablets for its purposes. That area dropped from a 13.6-inch average in 2010 to 12.1-inch in 2012 (with an ever so slight increase to 12.2-inches projected for 2013), a drop that represents a ten percent decrease overall and is largely attributed to the growth of tablets . All other areas have seen small to significant growth in recent years, with LCD TVs growing 9 percent, mobile phones increasing 38 percent, and portable media players jumping 29 percent. The biggest growth, by far, comes in OLED TVs, which have gone from a mere 15-inch average in 2010 to an average of 55-inches today -- a growth of 267 percent. 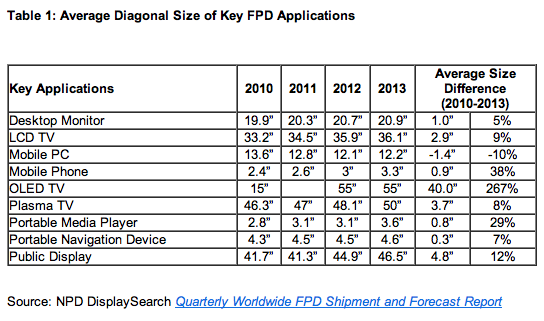 NPD study finds average display sizes continuing to rise in all areas but laptops and tablets originally appeared on Engadget on Tue, 16 Oct 2012 15:47:00 EDT. Please see our terms for use of feeds.